When you browse sites like Flickr or the pages of a magazine and spot really striking landscape shots taken during the day, with bright blue skies, defined clouds and strong contrast, the chances are they've been taken by a pro using a high-quality circular polarizer filter. So what is a polarizer filter? Polarizing filters are a great addition to any photographer's kit bag, because they're brilliant at enhancing saturation and contrast, helping you to produce more vibrant images - while avoiding the need to use Photoshop! They work by selecting which light rays reach your lens, and will cut through haze, deepen blue skies and boost contrast to give your landscape and scenic shots added impact. They're perfect for shooting buildings and cities on bright sunny days because they boost blue skies and increase edge contrast for more dramatic results. A polarizer filter can also cut through reflections in water - should you want to see river beds to give your landscape shots a different feel - and reduce unwanted reflections when shooting non-metallic shiny objects. 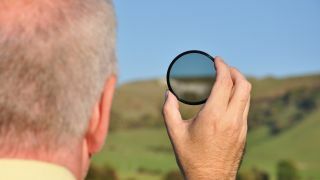 A polarizing filter will also help to reduce the reflection and glare of bright, white light, meaning you don't burn out your highlights so much. For the best results, shoot on sunny days with blue skies and a little cloud, with your scenes or subjects at 90 degrees to the direction of sunlight. Once screwed on securely to the end of your lens, rotate the outer ring of the filter to adjust the intensity of its polarizing effect. To ensure your DSLR doesn't try to counteract the work of the filter, set your white balance to a fixed setting such as Daylight. You may also need to dial in a little negative exposure compensation to avoid overly bright results: around -2/3-stop to -1-stop should do it. So, we picked a sunny day, rounded up five circular polarizers from five different makers and set out on location in Somerset to see which one is best. This Hoya PRO1 has been specifically designed for digital cameras. It's packed with technology: it's Digital Multi-Coated (DMC) to reduce lens flare and ghosting caused by reflections, and Low Profile Frame (LPF) with an ultra-thin filter frame to help avoid vignetting on wide-angle lenses, as well as being able to hold a lens cap. The PRO1 produced striking results, boosting colors and contrast in our scene without affecting the overall color balance of the shot. This PRO1 filter oozed good quality, from its lightweight build to the vibrant images we shot using it, and its black matte almite frame really helped reduce reflections. What's more, it also has black rimmed glass to decrease the chance of light reflecting off the edge and even comes with a UV protected case to lengthen the life of the filter. Image results were very good, and it certainly ensured blue and green colors became more saturated and appeared clearer with better contrast. Very affordable too. Like Hoya, B+W offers upmarket and premium options of circular polarisers. However, the physical differences are more noticeable, while there’s less difference in price. The more basic B+W F-Pro MRC costs about £110/ $145, has a standard range of multi-coatings and a thick profile. This XS-Pro ‘Nano’ edition features uprated coatings which are extremely anti-reflective, hard-wearing, water- and dirt-repellent and easy to clean. The low-profile design is also much thinner, being even more slim than in the Hoya filters. High-quality Schott glass is encompassed by a brass frame that has a matte black finish. While the ultra-thin profile makes vignetting unlikely, the adjustment ring is a bit tricky to operate. The B+W also adds a slightly warm colour shift. Lee offers two different circular polariser options for its square filter system. The less expensive is a regular square-shaped 100x100mm filter, which slots into the Foundation Kit holder (£55, $90). The square filter itself costs £160 ($220). The only drawback is that, because you have to rotate the entire holder to adjust the polarising effect, it can’t be used with other directional-specific filters, like a graduated ND filter. The 105mm Rotating Filter is therefore a better option, even though it’s more expensive and requires an additional 105mm accessory ring, at £35 ($60). The Lee has superb build quality and is equally impressive in optical terms. It makes an excellent addition to existing Lee filters you may already have, but is a very expensive option in its own right. One thing this filter shares in common with the B+W is that they’re both made of high-quality Schott optical glass. In other respects, they’re rather different. The Formatt-Hitech is designed to be used with square filter holders of varying sizes. The 95mm filter is compatible with the company’s 85mm filter holder, which is also compatible with the wide range of Cokin P-series filters. In addition to the filter itself, you’ll need a filter holder ring at £16 ($25), and an 85mm modular filter holder at £28 ($45). Both are made of aluminium and have a high standard of build quality. An adaptor ring for fixing the entire assembly to your lens costs about £12 ($18). The complete price is therefore pretty steep, but excellent optical quality is a good match for the upmarket build. Cokin’s P-series range of filters is renowned for being sensibly priced and offering a wide range of effects, with some 140 creative filters to choose from. Most are square or rectangular, measuring 84mm in width, and mount via a P-series filter holder which costs around £12 ($15). Adaptor rings are available for lenses with attachment threads of between 48mm and 82mm, which cost about the same as the filter holder. The P164 circular polariser filter has a round design and fits into the rear slot of the holder. A knurled outer edge enables easy rotation. The plastic holder feels flimsy compared with the Formatt-Hitech and Lee Filters holders, but this is reflected in the price. In our tests, we found a marginally warm colour shift along with a slight muddiness in darker areas.